A smart pop-up menu containing all your disks, folders and files. It can be called from anywhere you need it. Extremely easy-to-use, very customizable, Meta Commander greatly boosts the speed of your file browsing. 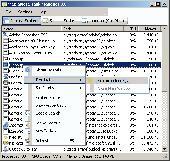 This utility program will help you check all your media (fixed or removable like diskettes, zip, magneto-optical disks, or CD-R,. ) and ensure that all your precious data that you store on them are safe and can be accessed successfully. Computes MD5 hash for any single file, can compare it with given. Integrates in Send To and shell on demand. Un-integrates on demand. Drag-and-drop supported. Automatically looks for corresponding md5 file with hash to compare, and vise-versa. Computes MD5 hash for any file, can compare it with given. Integrates in Send To and shell on demand. Un-integrates on demand. Drag-and-drop supported. Automatically looks for corresponding md5 file with hash to compare, and vise-versa. Large files supported. Progress indicator and cancellation. UNC (local network filenames) supported. Now with updates check support. search&replace text (and binary strings) in multiple files. . The MakeNotes program is intended for convenient notes management on your PC. Convenient notes list representation - inplace-editing, categories and more - it is easier to look, than to describe. The MakeNotes program is intended for convenient notes management on your PC. Convenient notes list representation - inplace-editing, categories and more - it is easier to look, than to describe. Major features: The convenient list of notes; Huge set of adjusted parameters; Drag-and-drop support; Skins support; Sticky notes support; Plugins support; Thousand other things!